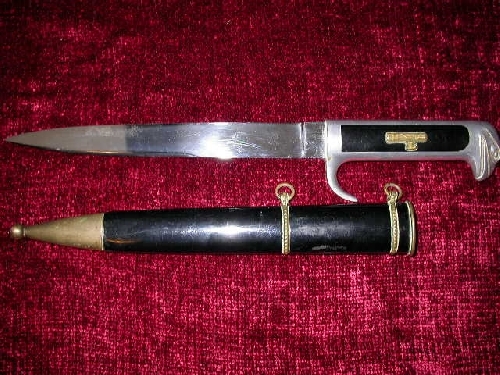 This is a rare Model 1937 Italian MVSN dagger with aluminium eagle head pommel and black bakelite grip insets containing on the one side the Fascist Italian symbol. 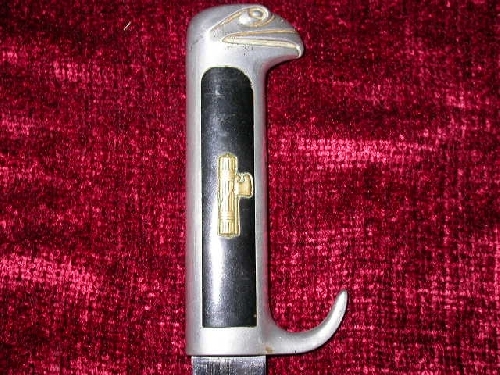 The blade is virtually mint the scabbard has a thin line on the reverse between the 2 hanging loops which appears as a shallow thin crack but may be the seam of the black enamel. Very minor pitting around eagle head on the one side but otherwise in very good condition. One hanging look has been slightly bent upwards but is not loose in any way. Post worldwide however postage give is UK post and please enquire regarding overseas posting costs.